The Australian Human Rights Commission Act 1986 (AHRC Act) prohibits discrimination in public and private sector employment. The AHRC Act includes a broad range of grounds of discrimination in addition to those in federal discrimination laws. or imputation of the above. The definition of discrimination in the AHRC Act is also different to the definitions used in federal discrimination laws. in connection with employment as a member of the staff of an institution that is conducted in accordance with the doctrines, tenets, beliefs or teachings of a particular religion or creed, being a distinction, exclusion or preference made in good faith in order to avoid injury to the religious susceptibilities of adherents of that religion or that creed. 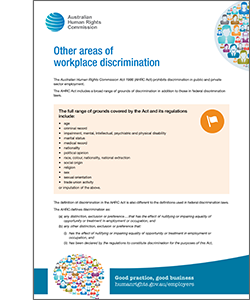 The process for resolving complaints of discrimination in employment under the AHRC Act is also somewhat different to federal discrimination laws. When the Commission receives a complaint about an issue that is covered by the AHRC Act, the President of the Commission can inquire into the complaint and try to resolve the complaint by conciliation. The President may decide not to continue with a complaint where, for example, the President is of the opinion that the complaint is lacking in substance or has already been dealt with by another agency. If the complaint has not been resolved and the President is satisfied that discrimination has occurred, then the President will prepare a report for the Federal Attorney-General. The President can make recommendations in this report to compensate the person who has made the complaint for any loss or injury they have experienced. The report may be tabled in Federal Parliament. A key issue for employers is assessing whether a person can perform the inherent requirements of the job. As an employer, it is your responsibility to clearly outline the essential duties of all positions in your organisation. Employers should choose the best person for the job. They should not make assumptions about what people can and can’t do, or whether they will ‘fit in’ to the workplace, because of their background. For example, an employer can only refuse to employ a person on the basis of their criminal record if it is clear that the person’s criminal record means they will be unable to perform the essential requirements of the job. in selection for redundancy or dismissal. It is also the responsibility of the employer to ensure that employees are not harassed or bullied in the workplace because of their background or characteristics protected under the AHRC Act. A hostile working environment can contribute to people feeling as though they have no option but to leave their employment. Zara was recruited as an accountant with a small manufacturing company, via a recruitment agency. She told the recruitment agency that she was a Muslim and would need to arrange a room at the workplace where she could pray. This would involve three 10 minute prayer breaks during the day and during her lunch break. Zara said the recruitment agency subsequently advised her that the company had withdrawn the offer of employment because of her need to pray. Tony applied for a caretaker’s position with a horticultural society. He was offered the job, subject to a police check, and was told that he could move into the caretaker’s residence. Tony advised the society that he had prior convictions for drugs and driving offences and was told ‘everything should be fine’. He took the job and moved into the residence. Five weeks later his employment was terminated after the society received details of his criminal record. There had been no complaints about his work performance to that point. Anna, a union delegate, was employed as an administrative assistant in a public hospital. She said that when she approached her manager to pass on a message from the union regarding the change of a meeting time, her manager shouted abuse at her, shook her finger at her and told her ‘you people do not want to get the dispute resolved’.